Cello lessons at Vivaldi Music Academy in Houston are individually tailored for students of all ages and levels who love the rich tone of the cello. Teaching methods such as traditional, Suzuki or a blend of both are utilized in cello lessons by our faculty to help you learn classical music, fun popular songs or even your own improvisation. Beginning students start with the fundamentals of cello lessons, including proper technique in holding the cello, comfortable hand position, and holding the bow. Advanced students continue to progress in their cello lessons with gradually challenging exercises, correct intonation, position shifting, and phrasing while learning more significant repertoire. Cello lessons include theory, ear training, sight reading, technique, and history. Both our West University and Bellaire locations provide comprehensive cello lessons and music education. The violoncello or cello is the tenor voice in the string family. Although shaped like a violin, the cello is much larger and is held between the player’s knees. The popularity of cello lessons has especially risen in recent years due to the beautiful and rich sounds the cello can produce from its lowest to its highest notes. Like all the members of the violin family, the cello first emerged in Northern Italy in the first half of the 16th century in the workshops of famous instrument makers like Andrea Amati and Gasparo da Salo. The cello is primarily an orchestral and chamber music instrument, but it is also heard in jazz, folk, rock and pop music as well. Famous classical cello players include Yo-Yo Ma, Jacqueline du Pre, Zara Nelsova, Johann Sebastian Paetsch, Mstislav Rostropovich, Janos Starker, and Maurice Gendron, to name just a few. Well-known jazz cello players include Oscar Pettiford, Harry Babasin, Dave Holland, Abdul Wadud, Ron Carter, Oscar Pettiford and many others. Rock/pop bands that have used the cello include Led Zeppelin, the Beatles, ELO, Genesis, Pink Floyd, and Aerosmith. 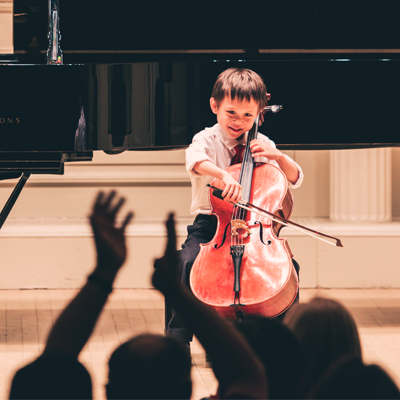 Why choose us for cello lessons?